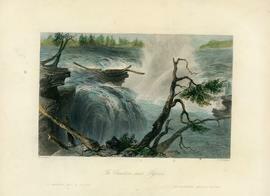 Coloured engraving titled "The Chaudière near Bytown" by William H. Bartlett, published in 1840. Coloured engraving titled "Pass of Bolton, Eastern Townships" by William H. Bartlett, published in 1840. Item is a photograph of the steamboat called the Pocahontas on lake Massawippi. Item is a photograph of aerial photograph of Ayer's Cliff. Item is a photograph of H. A. Norton's peony and lilac garden with Lake Massawippi in the background. People came from as far as California to see her three-hundred flower varieties. Item is a photograph of Bacon's Bay located in Ayer's Cliff, with a boat in the water. Item is a photograph of a tiny house with Bacon's Bay directly behind it. Item is a photograph of a bridge with people standing at the end of it. 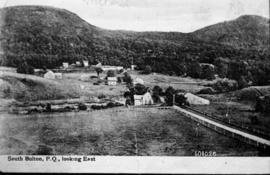 Item is a photograph of the town of Ayer's Cliff taken from Brown's Hill. Item is a photograph of a view of Ayer's Cliff and surrounding landscape.